In June of 2018 we returned to Sri Lanka to work in the village of Illavalai, outside of Jaffna, Sri Lanka. 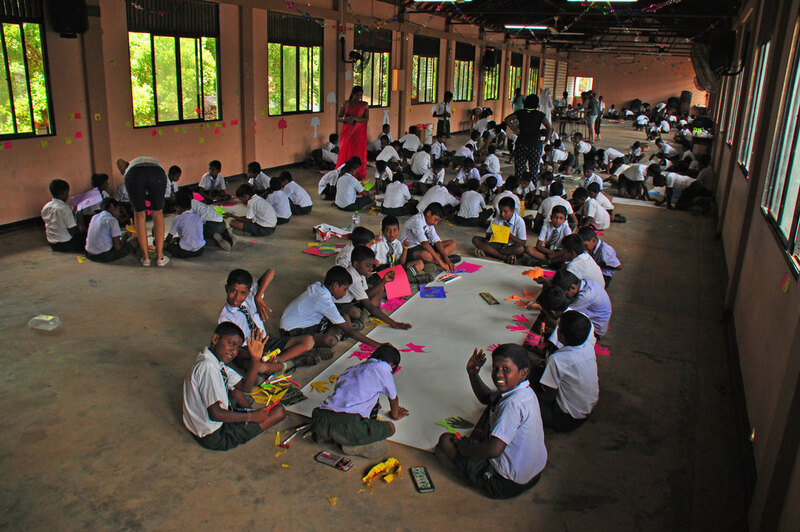 Our partners were St. Henry's College in Illavalai, Alampil Roman Catholic School in Mullaitivu, University of Hertfordshire, England art therapy students, and Lefika La Phodiso, Johannesburg, South Africa community arts therapists. Projects across six different student groups were designed around healing and creative expression. ​When children and youth are subjected to violence and conflict, they are disproportionately and uniquely affected...their resilience and social emotional well-being are essential to any post-conflict long-term reconstruction, development process or long-standing peace” (Diaz Varela, Kelcey, Reyes, Gould, Sklar, 2013)." Similar to our work in 2015, our workshops in Illavalai began with opening circles, adopted from restorative justice practices. By bringing together these processes with storytelling and the arts we wanted to provide a space for the children and youth to explore oftentimes difficult experiences in a format that was less threatening, and that incorporated community, freedom, joy and play (Nussbaum, 2010). 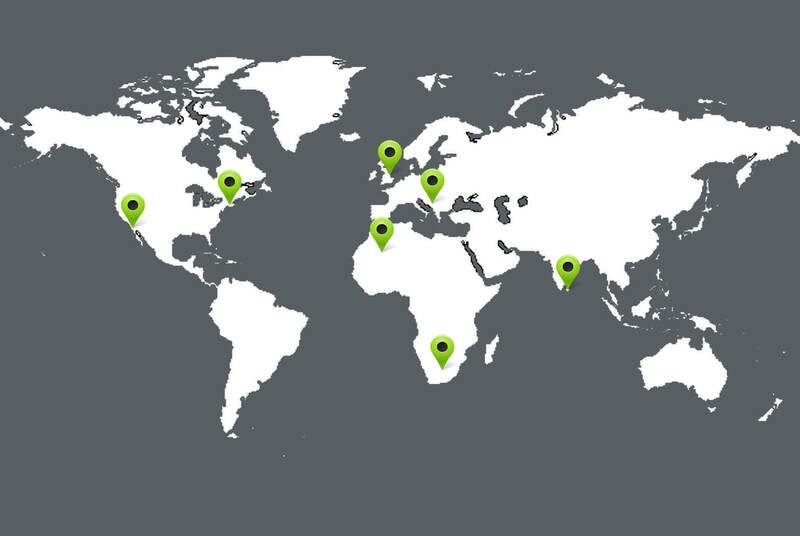 This year we had between 70 to 90 students for each session, twice the size of the groups we worked with in 2015. To be inclusive and to serve as many boys as possible, we organized them into three groups of 30 for each session. Luckily, we had a total of 9 teaching artists, art therapists and art therapy trainees as part of our team along with assistance from a team of educators and counselors from St Henry’s College. The students were asked to respond to a range of open-ended prompts shared across the group before drawing and/or writing their responses onto colorful post-its. All four classes, grades 6 through 9, also completed an “I Am Poem” – finishing statements such as “I am…, I hear…, I want…I wonder…” before moving into creating imagery reflecting their answers. Through these processes, students were provided space to reflect on their internal world and to be with the self. They also engaged in community building exercises and developed personal symbolic imagery, which was then incorporated into the projects throughout the week. In a country so recently coming out of a long term conflict, asking students to consider such things is a sensitive process and not easily put into words. The art workshops provided a safe space to explore and express while the wider space, the art making room, provided a place where children were witnessed and held in unconditional positive regard. ​Starting with the tracing of their two hands, the Grade 6 boys explored self and family through the creation of a series of large collaborative murals on paper. As the entry point we asked each boy to trace the outline of their hands and to add personal imagery linked to what was shared in the opening circle and the “I Am” poem. We chose the handprint as these are a powerful mark of our individual identities. Different children took their art to different stages and several boys created multiple drawings before getting to a final work they were happy with. Families strongly define children at this age and these references were included in their collective imagery and mark making. Next we organized the boys into three smaller groups, each assigned to a mural. Handprints were cut out and each group of boys worked together to place and glue their hands onto the mural. 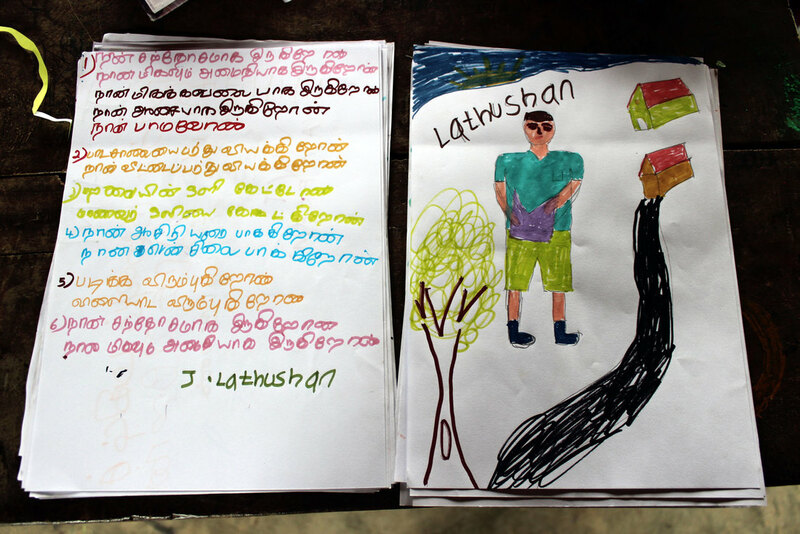 Next steps included drawing more personal imagery around the hands before moving into visualizing and drawing connections between their selves, their friends in the group and the broader community of Illavalai. Grade 7 worked on metaphorical portraits, exploring their own identity through the creation of animal beings. With responses and imagery from the “I Am” poems as a starting point, students were then asked the question ‘If you were an animal what kind of animal would you be?’ The opportunity to portray themselves as an animal meant the students could play with and explore their own perceptions of themselves. Using metaphor creates distance, enabling you to look at yourself from a safer place. The students were invited to use their imagination, what if the animal had special powers, what if it were two animals in one, what if you created a new animal, what would it look like then, what could it do? This created a sense of fun, excitement, and encouraged creative thinking. While making the art, the children layered images on top of one another, revised their work, painted over and embellished their images as they went. They were asked to consider the animal’s environment, where does it live, what does it need, does it have what it needs? This allowed the students to share ideas or to process unconscious beliefs and experiences of their own environment, history, and psycho-social needs. On the last day of the project the children’s grins conveyed a sense of pride in their art work and themselves. They were invited to write reflections on the process, which revealed a range of experience and benefits. Some children were grateful for the time and relationship with the art team, others said the drawing and painting made them happy, while others enjoyed feeling skillful (see photos of the written reflections). St Henry’s was especially excited for us to work with the boys to create a mural on the school grounds. Designing and painting a wall mural with 70 plus Grade 8 boys is no small feat! To begin the design process, the boys were asked to consider and sketch symbols connected to two questions: What are the challenges in your community? And what are the parts of your community that you cherish? By posing the questions together, we highlighted the space that often exists between the two and tried to bring to the fore those aspects of the boys’ worlds that they cherished and valued. Using these responses, students chose one image and drew it onto large paper. These symbols were used as templates to transfer the designs onto the physical wall. The boys then chose the colors they wanted to work with and painted in the symbols. The painting process got quite chaotic at times, with the boys’ painting spilling onto a wall around the corner without our knowing it. After discussions between the team and Father Godfrey, Rector of the school, we came up with a plan to design a painting around the more impromptu mark making. You can see this imagery in the photographs, which includes a tree, a heart and a figure against a white background. We turned the challenge into a teaching moment and a beautiful mural. A Body Map is best described as a drawn outline of the body on a large sheet of paper. 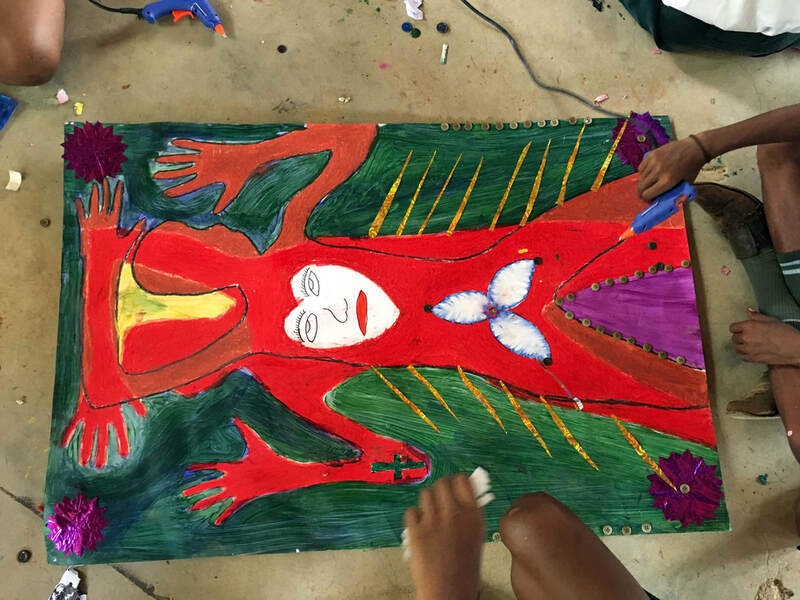 Body Mapping is the process of creating body maps as a form of art and narrative therapy used to gain understanding of ourselves, our bodies, and the world we live in. This project offered a powerful invitation to Grade Nine students to engage with ‘the self’ creatively. In teams of two, the boys drew their body shapes with great excitement and laughter before moving into an exploration of their inner selves using a variety of vibrantly coloured paint. Once the first layer of color and imagery was completed, the boys could be seen reflecting on their works with a combination of pride and contemplation. With encouragement from our team, they continued working, choosing paper fragments, symbols, colours and textures as an unfolding expression of the ‘inner’ character in visual form. 3-D reliefs were also added as a way of highlighting specific symbols and areas of the bodies. The visual narratives can be seen in both the ‘inner’ and ‘outer’ space around the body shapes, suggesting to us the simultaneous engagement of the boys with their internal and external worlds. ​Play is so important to optimal child development that it has been recognized by the United Nations High Commission for Human Rights as a right of every child" (Convention on the Rights of the Child, UNHCR). ​As part of our teaching routine, we met daily with the after-school Recycling Club, a group comprised of primarily middle school boys. Working with an informal educational model centered around play, we co-created projects using recycled and found materials. Our first endeavor was to build a large-scale inflatable sculptural piece using newspapers, glue and air from fans, introducing the boys to play in artmaking using readily available materials. Through the shared work and laughter we began to establish our community. For our second project we started building a small fort outside using natural materials. We worked in teams, with some boys weaving palm fronds, others painting small rocks, while others focused on building the structure. The entire process for the fort building was directly informed by the ideas of the boys with our team acting as facilitators and material gatherers. Play was integral to the work, with small groups playing limbo and jumping rope. At one point, a few boys ran off to find a piece for the fort and came back, ceremonially carrying a large tree like plant to be added to the fort. Check out the video below. Our last series of projects focused on open-ended tinkering and making using primarily plastic water bottles, tin cans and paint. During these workshops we could see the boys opening up in ways that expressed risk taking, perseverance, joy and care. It was truly special to meet old friends and to see all of the students at the Alampil RC School. As we only had one day to work with the community, educators at the school selected about 70 middle school students to participate. These students were split into smaller working groups, all taught in a large classroom. The arts experiences were aimed at providing spaces for the students to engage in solo and collaborative expressive work. Our art therapy team from Lefika La Phodiso asked the children to choose a small comfort doll brought to the school, and to tell us how it related to themselves. The idea was to help them enter a space for introspection and then sharing out to the group. In this session, students expressed their hopes and dreams that ranged from future career choices to the attributes of being a healthy, positive person. Finger puppets were created in response to the reflective discussion and students were prompted to make the characters come alive through dialogue. From there the process evolved and as you can see from the images, each puppet appears to be arranged and framed in what look like shrines. ​Three other groups worked on a range of large-scale murals that asked students to create metaphorical portraits in the form of animals. Initially some of the students copied the animals shared by the facilitators in the opening circle, a not uncommon occurrence when working within such a relatively short time frame. But as the work progressed and moved into embellishment, cutting and pasting, personal choices in the artmaking came to the fore. Each group then moved to a large mural, on to which they placed all the animal portraits at the end of the session. One group of boys skipped attaching drawings to their mural and instead spent most of their time engaged in kinesthetic responses to the mark making, using their entire bodies for applying chalk onto the paper. The creation of the group pieces allowed the children to work together, negotiating boundaries, exploring relationships and cultivating a sense of support within the group. The placing of the portraits meant the children could see themselves as part of something bigger, a wider community and explore their place in that. The hanging of the large group piece initiated moments of celebration, children congratulating one another. Looking together at the final mural seemed to foster a sense of achievement, and togetherness in that achievement. Next year we will return to Illavalai and Alampil with the hopes of expanding our reach to include a total of 4 schools. Stay tuned! In March 2016 Dr. Maguire, Co-Director of ArtsAction Group and a Associate Professor at Adelphi University, was invited to work with children and youth in Mullaitivu, Sri Lanka by the Jesuit Centre for Social Concern. She and Dr. Rob McCallum organized the workshops through ArtsAction Group with support from Adelphi. The projects were introductory in nature and aimed at psychosocial healing and personal and group creative expression. 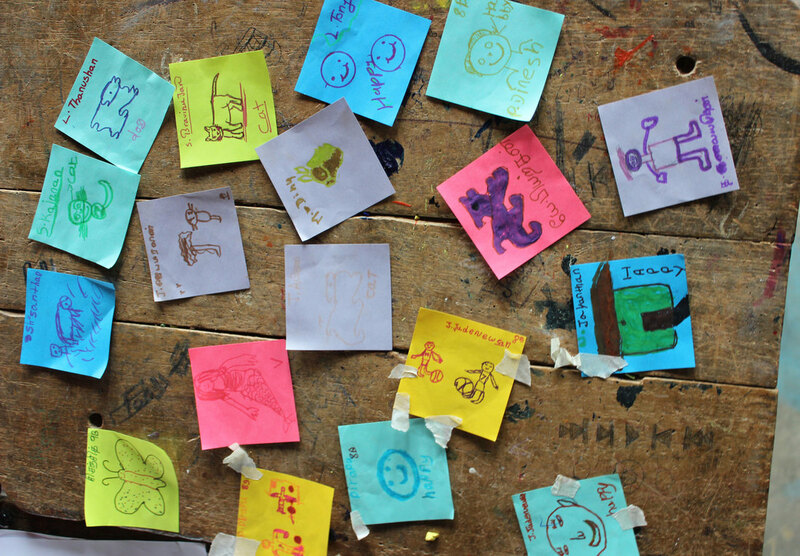 For five days we worked with the community at Alampil Roman Catholic School to forge new friendships and to create the work you see here. The older students in grades eight and eleven, created a series of body maps (see below). Each day we began the workshop with an opening circle, a process adopted from restorative justice practice. In the circles, students were asked to respond to a different open-ended prompt. Examples ran from the concrete, "My favorite thing to do is..." to the more abstract, "I wonder about...". Responses were shared with the group and then individually drawn and/or written on a post-it, which were posted each day on the wall. The body map project itself began by students viewing a series of artworks created by contemporary artists who combine visual imagery with text to deal with issues of identity. These included Mark Bradford's merchant poster series, portraits by Sharin Nashat and paintings by Pala Pothupitiye. Following the discussion about the artists' work, each student filled out their own I Am Poem. These poems became the content of the artwork as the text was adopted and translated into visual imagery and metaphor. Each body map was created by a team of two students who worked together to create these hybrid identities that you see here. For the younger children, grades two through five, we focused on the concept of storytelling. We can tell a story about our own lives and personal experiences and we can also use storytelling as a means of visioning something for our future. On the first day each student did drawings of their homes and families. These became the initial content for the large-scale group murals depicting their villages which were then expanded to include hospitals, schools, roads, beaches and more. 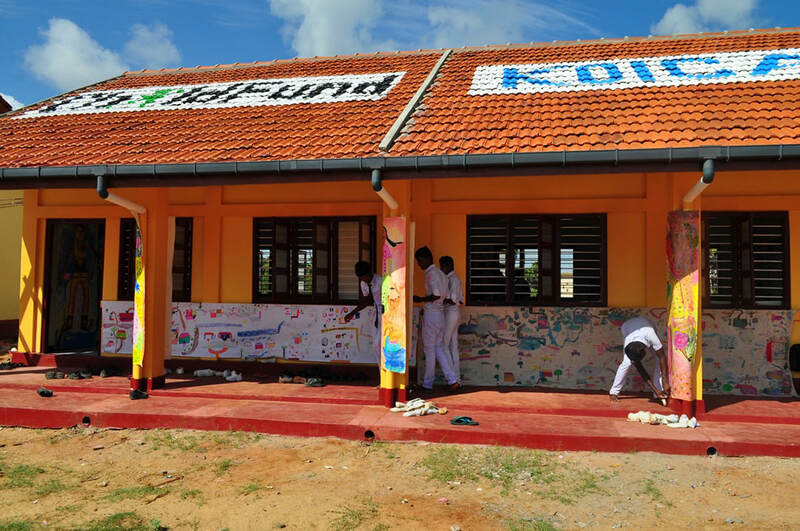 While paint is available in some areas, most of the students do not have access to the kinds of materials we provided. Next year we are planning on incorporating resources from the region into the art and design processes including coconut shells and palm fronds! On day four we introduced the concept of sequencing in storytelling. Each paper was divided by into four squares: a title page, a beginning, a middle and an end. Students were asked to consider a family story and to draw the story on the paper. Images documenting our collective processes. Creating the artwork and preparing for the final exhibition.